Is it reasonable to say Value Selling is the optimal way to achieve best selling outcomes for complex B2B selling? Most of us are familiar with terms such as Value Selling, Challenger Selling, Customer Alignment, Hypothesis Selling, Critical Success Factors, Provocative Selling, Selling to VITO, Complex Selling and many more. These are different labels and descriptions that share core, fundamental principles to what might reasonable be called “High Performance Selling”. If this is correct, then Value Selling (or whatever you prefer to call it) should be acore business function* for a selling organization. * A “core business function” would reasonably be described as a function fundamental to the operation and execution of a business. I unashamedly maintain that Value Selling is every bit as important as traditional sales functions such as CRM, order processing, and others. Perhaps more so. 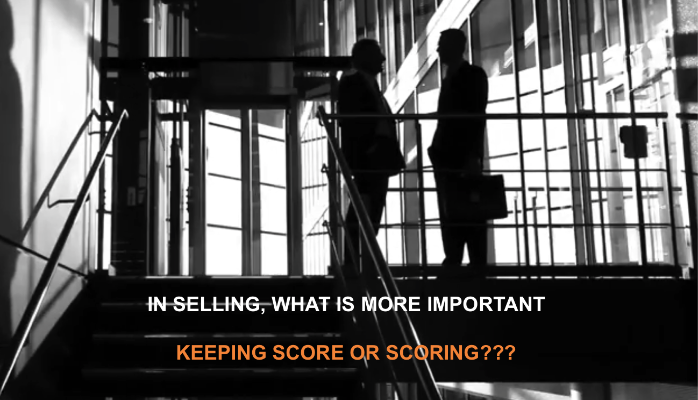 What’s more important, something that keeps score of sales results, or something that helps sales pros score??? Michael Jordan, or the guy keeping the scorebook??? Mickey Mantle, or the guy keeping the scorecard??? No offense to providers of CRM, marketing automation, etc., but I think the answer is obvious. Professional organizations haven’t existed to promote the function, share best practices, facilitate training, etc. The first two are classic scenarios of 1) organizational intent and b) “buy versus build” of business applications. Organizations don’t treat other core business functions in a diminished way. GL, CRM, Order Processing, Payroll? Not a chance. Nor do organizations build these kind of applications. Ever. The third has been true…until now. Chartered in 2015, the Value Selling & Realization Council (www.vsrcouncil.org) is a non-profit, global organization exclusively dedicated to enhancing the effectiveness, awareness and growth of the value selling and value management professions. A truly exciting endeavor, Founding Members include over 20 leading providers, such as SAP, Oracle, Salesforce, Workday, IBM and yours truly, DecisionLink. To get fully up-to-date on the latest thinking and approaches to value selling and Realization, attend the the world’s first VSR Value Summit in Dallas on 29-Feb and 1-Mar. 2016, Over 100 value leaders and practitioners will convene to share their best practices, methods and to network. You can sign up at VSR Summit. Look forward to seeing you there! To learn more about robust systems that solve the 2nd problem, helping our customers make Value Selling a “Core Business Function”, visit DecisionLink. ABOUT THE AUTHOR: Jim Berryhill is Co-Founder and CEO of DecisionLink Corporation. Jim has extensive experience in sales and executive management, in roles from individual contributor to leading sales organizations with several hundred sales professionals and $1 billion in revenue. One of a handful of sales executives who has carried a quota for 125 quarters for publicly traded companies in the tech industry, he is an ardent believer in customer aligned value selling. Jim founded DecisionLink to bring automation and systemic support to what should be a core business function for all B2B organizations.